Real Estate is an important part of everyone and it is the basis of all wealth. Every Malaysian wants to own a property. They invest their life savings in order to obtain a shelter over their head, to be secure and protect themselves under a roof. 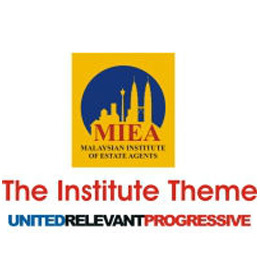 All over the world, Real Estate Agents play a cardinal role in helping the public at large to invest and divest in properties and in Malaysia it is no different. The estate agents biggest and single most challenge is to be united. Unity is the binding factor that will allow us to have one voice, one common goal and one vision. Estate agents must take pride and take ownership of the practice by working together for the common goal of the profession. As the old adage says "Unity is strength and strength is mighty". The call is for leadership, the council, the members and the negotiators to work in unison and in unity to tackle the daily issues we face. The Institute must be relevant to the members by meeting their expectations. The programmes and activities will all be aligned towards this goal. By the same token, members must also be relevant to the institute by participating in the committees, programmes and to give ideas and feedback. When one is united, there is peace and harmony, and when there is relevance, there is respect. When this is achieved, there will be progress. When we progress, there is growth and this growth leads to betterment of our business and our lives and as a result, we achieve recognition, respect and success. Only then can we bring change to the industry and be a dynamic Institute.